The ship of emigrants left from Rotterdam, Holland, May 15, 1909, bringing the immigrants to the United States en route to their various final destinations. Herman's town of last residence in Holland was Nymegen, and his final destination was Kimberley, Wisconsin. 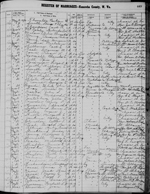 Index to the Names of 30,000 Immigrants to Pennsylvania, 1726-1776.